UPR's new Mustang Rear Coil Over Mounting Kit for all 79-04 Mustang. This kit was designed to use the factory shock mounting points. Eliminating the need for any welding or fabrication. Giving you the benefits of a true coil over rear suspension. 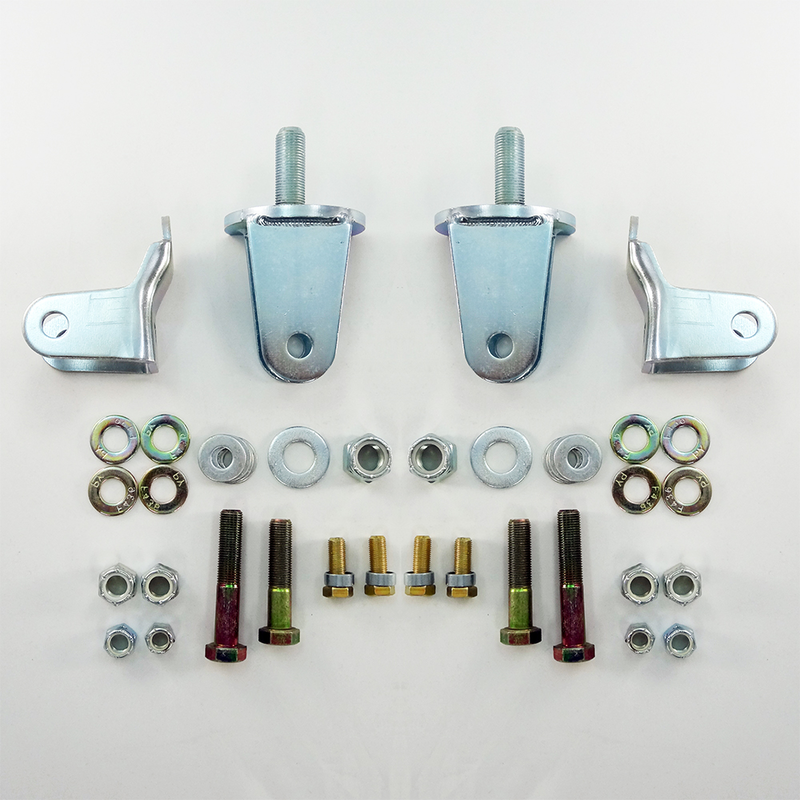 This kit includes 2 upper shock mounts 2 lower shock mounts along with all the necessary Grade 8 hardware for a complete installation. Designed for use with Viking Double Adjustable and QA1 12 way adjustable shocks but upper bracket will fit up to a 1" wide shock mount. The lower bracket will fit up to a 1.5" wide shock mount. Our lower bracket has been redesigned to eliminate spring clearance issues that all other manufacturers have. The main benefits from a coil over suspension is the reduction of unsprung weight. You save an average of 15 lbs off the rear of your mustang. Ride height adjustment up or down allowing you to dial in your suspension for the conditions you'll be using the car in whether it's on the drag strip, road course or on the street. Quality Construction: Shock Mounts made from 3/16" Steel, Mig welded and zinc plated for corrosion resistance and durability. Hardware is Grade 8 for bracket and shock mounts. No one else gives you the bold clean styling of our Aftermarket Dress Ups, Suspension and Performance Parts for your American Muscle Car like UPR Products! Installs in 2 hours or less. Fits these Vehicles: 1979 1980 1981 1982 1983 1984 1985 1986 1987 1988 1989 1990 1991 1992 1993 1994 1995 1996 1997 1998 1999 2000 2001 2002 2003* 2004* V6 GT Mustang Bullitt Mach 1 Cobra Roush Saleen Vehicles. * Does not fit Cobra with factory IRS. **Does not include shocks or springs. See our Related Items for complete kits with shocks/springs. ** Made in the USA!